· Live Recording and fast FTP file upload. · 2 x Ethernet Gigabit interfaces with bandwidth aggregation support. · Permits the assembling of up to 10 incoming sub-streams and its restreaming to other MPEG-TS and/or RTMP compatible codecs. · FEC and Active Packet Recovery to recover lost packets. · Error Concealment to reduce the impact of packet losses. 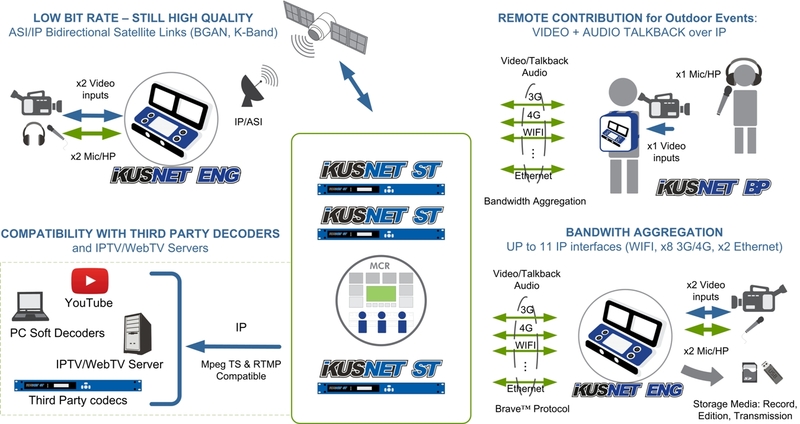 · NAT Traversal Remote control via web interface of a portable Ikusnet from Ikusnet ST.
· File storage using internal HD or external USB memory. · 1080i to 720p and 576/480i to 576/480p de-interlacer included.